Music with a Mission is proud to kick off its sixth season by featuring the music group, Bold Riley, for an evening of folk music on Saturday, February 3 at 7 p.m. at North Windham Union Church (NWUC), 723 Roosevelt Trail in Windham. Bold Riley started as a simple music project among friends, but quickly gained momentum, thanks to the group’s contagious enthusiasm and commitment to bringing joyful acoustic folk music to the greater community. Comprising members from all over southern Maine, the group is known for its soaring vocal harmonies and diverse instrumentation. Fiddle, guitar, banjo, accordion, bass and an ever-expanding list of percussion allow Bold Riley to provide a wide range of music to its listeners. 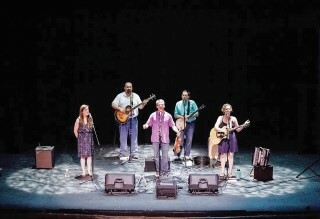 Members Dennis Boyd, Jr., Julia Edwards, John Gunn, Michael Hayashida, and Erin Sampson take turns singing lead; and songs range from classic folk favorites to unlikely covers to rousing originals. This milestone concert is the 50th in the Music with a Mission series sponsored by NWUC. The church donates a portion of the proceeds to area non-profits. The first 49 concerts have provided over $51,000 for mission support to the church and other community organizations. Bold Riley has chosen to support Habitat for Humanity with the community proceeds from this concert. Seeking to put God’s love into action, Habitat for Humanity brings people together to build homes, communities and hope. Over the past three decades, they’ve built 75 homes, providing hundreds of people with stable, affordable housing. Tickets will be sold at the door and online at mwamconcerts.com and are $12 for adults and $10 for students, children, and seniors (surcharge added for online ticketing). The box office opens at 6 p.m. and the doors will open at 6:30 p.m. For more information please call 892-7149 or email MWAMconcerts@gmail.com.